This 10 day program is designed to provide new trainers an extensive guide to assist them in developing and presenting quality training programs in the classroom as well as experientially. 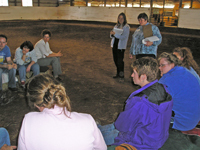 The certification program focuses on Equine Assisted Learning concepts from a corporate training standpoint. 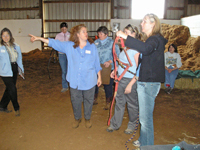 It is also designed as a great refresher for the more experienced trainers to hone their skills as well as add Equine Assisted Learning to their training skill set. 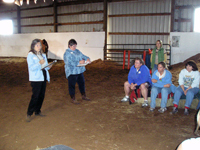 At the end of this course, participants will be able to thoroughly prepare for and deliver an effective Equine Assisted Learning program according to training principles discussed and practiced in class and the Instructional Systems Design Model of Training and Development. 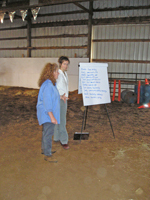 Check the Schedule of Events for the 10 day intensive Equine Assisted Training Specialist Certification Program (EATCP) public seminars! Download the EATCP Registration Form (Word / PDF) or Register Online. To schedule your attendance in the Equine Assisted Training Specialist Program, other EAL seminars or for additional information, please contact us at 254.290.3446, email us at info@innovativehorizons.com or inquire online. "Tim, you are the heart and soul of this course. You instill in your students not only a desire to do this work, but also the tools and confidence to do this work.Thanks for giving me more than I ever expected. I feel honored to have been your student and proud to call you my friend." "I want to thank you for everything! You are a gifted man and a wonderful instructor! 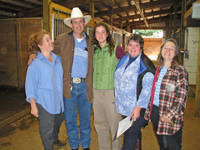 Not only does this program provide you with all the training and tools necessary to conduct successful equine assisted professional development programs, you encourage, support and motivate your students every step of the way. You went above and beyond meeting my expectations! At the end of his program, I felt competent in my abilities along with the knowledge and confidence that I can and will succeed!" "Tim, you are an excellent facilitator and teacher. You have developed a very comprehensive program and an outstanding EAL facilitation model. Thank you." 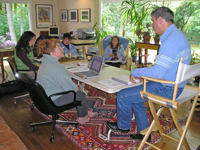 "This is a focused, well directed, and lively 8-Day Training. The material is delivered in an interesting, comfortable and fun manner. The positive feedback at the conclusion of the workshop from my 10 participants confirmed they'd learned a great deal with the horses, each other, had fun doing it and could apply their experience to their day to day lives. 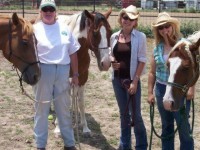 I'd recommend this training to anyone with an interest in working with people and horses. " "Superior! Exposed to concise and specific material that is a foundation to facilitation of EAL that also enhances the other teaching and training activities I engage in."